Agile pletform for you documents with unique architecture which will simplify your business. User interface designed to be used on screens of all sizes. Latest HTML5 technology of highly flexible user interface. <strong>Navigation</strong></p> <p>Dynamic and simple access to your documents. <strong>Search</strong></p> <p>Fast and all-around search for descriptive and content data of documents. <strong>List</strong></p> <p>Adjustable and useful list of your documents, always at hand. <strong>Workspace</strong></p> <p>Clear and manageable display of descriptive data of documents and their attachments. <strong>Tabs</strong></p> <p>Show important data, upload attachments via “drag & drop” functionality. Certified by the Archives of the Republic of Slovenia. SSL encryption for all communication. Integrate mDocs with your software. 100% cloud service, output of Slovenian knowledge. Pay only what you consume, nothing more. All data is saved securely in data center. Customize interface to look and feel of your organization. The best practices packed in “Out of the box” solution. Flexible module for listing and distribution of e-mails with focus on secure and centralized storage. Liquidation of physical and electronic invoices in few steps. Keeping track of requests and planning of work absences. All documents about employees kept in one place. Capture the documentation with mScan solution regardless of a dispatch location. Pair the documents with database and get rid of duplicate entires. Drive document through business process you know. Be notified and dynamic, confirm the document on way. Let us worry about storing the documents in a safe e-storage. Save your time with highly capable tool for document capturing and content recognition. View and confirm document straight from MS Outlook email client. Main benefit of MS Outlook extension for mDocs is that you don’t have to leave email client. You can view and confirm documents straigh from the view of single email. If you wish, you can still open whole document in a browser by clicking the link in the email. MS Outlook extension offers viewing descriptive data of document and its attachments straight from the email client. It’s important to note that attachments are always present in mDocs, not in email massage. However with one click you can confirm or reject it without leaving MS Outlook. You can also open the document from email client in mDocs web interface. 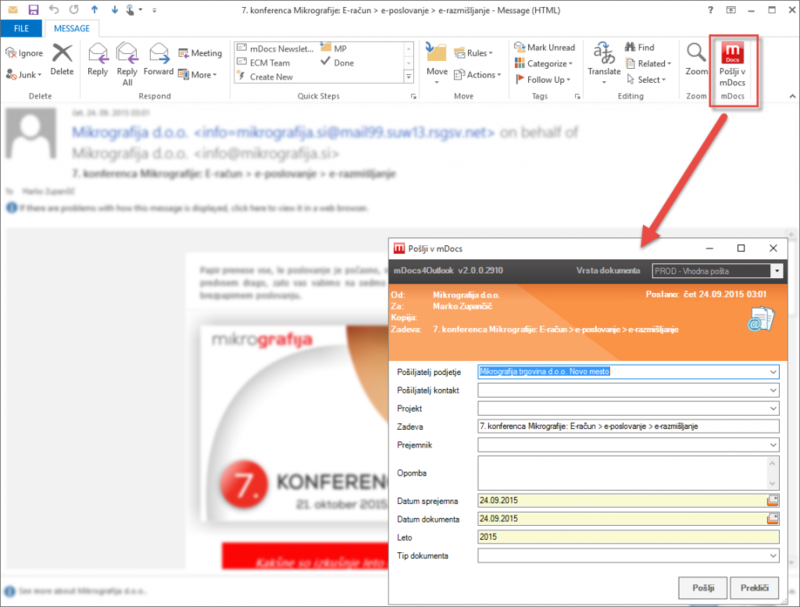 Dodatek za MS Outlook omogoča pošiljanje elektronskih sporočil v mDocs rešitev neposredno iz odjemalca. Pri tem vam vmesnik prebira šifrante neposredno iz mDocs rešitve. Ob prenosu elektronskega sporočila v mDocs rešitev, pa se poleg priponk in opisnih podatkov lahko prenese tudi vsebina sporočila na način, da se le-ta pretvori v PDF, DOCX oblko ali pa ohranite izvirno MSG obliko sporočila. Sign documents electronically and be sure about authenticity and immutability of documents. EASY View Plus extension lets you convert and view over 300 different formats of attachments, some used rarely. For example you can view Microsoft Office for template, Open Office formats, images, e-mails and AutoCAD. At the same time it offers configurable adapters/interfaces for formats that aren’t supported by default. The extension comes handy when used in mDocs on mobile devices and on stations that don’t have installed software for opening particular type of attachment. Upload MS Office attachment to mDocs and next time view it as a PDF. A lot of companies face a similar issues – their critical documents are wrongly put down. As a consequence, time sensitive informations get lost in their circulation which resemble a Bermuda triangle. Decide for document system and solve problem of electronic handling of documents in your business environment. The mDocs document management system is a top-of-the-line solution in electronic document management in a business environment. The system is distinguished by its modular design and exceptional flexibility, and therefore meets the wishes of its users as well as the companies’ requirements. The software’s modular design allows upgrades and enhancements to keep up with the developments and business growth at any point in the life cycle of the process or solution. Adjustments can be made quickly and simply, while the intuitive user interface enables the user to promptly become familiar with each added functionality. Our company takes an agile approach and endeavours to provide complete software solutions, which is why every solution is customised to suit the client’s environment. Numerous custom-made solutions reflect excellent communication and collaboration with clients. The mDocs document management system (DMS) is being used in Slovenia by as many as 46 companies of all sizes, while many of our satisfied clients, who have chosen this solution, can be found in Croatia, Bosnia and Herzegovina and Serbia. Most of them instituted the document management system with the aim of managing their electronic operations, since a modern document management system integrated with business processes can raise the company’s organisation and employee productivity to another level in addition to enabling document management and storage. Let the system match the purchase order with the invoice received. Have complete control over the orders made by the employees. Eliminate manual management of physical purchase orders. Trust the advanced control of the mDocs solution over the accuracy of the data on the purchase order. Validate orders on the go. Take a step towards paperless operations and choose the document management system that will bring added value to your organisation. The best in business operate paper-free. Become one of the best in business! Contact us if you are interested in mDocs!